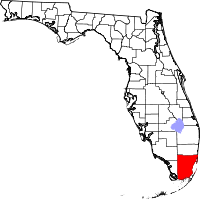 Nickname(s): "Dade County", "Dade", "Metro-Dade", "Greater Miami"
Miami-Dade County (formerly known as Dade County and many times referred to as simply Miami or Dade) is a county in the southeastern part of the state of Florida. The United States Census Bureau estimates that in 2006, about 2,402,208 people lived in the county. That is more than any other county in Florida. Among all United States counties, it is in eighth place. The county seat is the city of Miami. Miami-Dade County Public Schools (MDCPS) is the 4th largest school district in the United States. The Miami-Dade School Board is a nine-member publicly elected body responsible for overseeing the administration of the (MDCPS). This page was last changed on 25 May 2018, at 17:21.